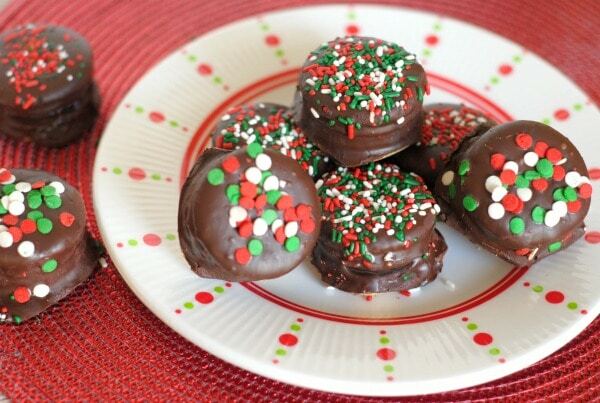 Make the holidays bright with Oreo Stuffed Chocolate Covered Ritz Crackers! Last year during the holidays we were in the middle of moving and just closing on our home shortly after Christmas. Since we were swimming in boxes, that meant we did VERY little in the way of making treats and such last year. The year before I made all sorts of homemade goodies, then we went and delivered them to friends and family. Last year, I felt lost without doing this because it is one of the things I enjoy the most. I like to have my son help in the kitchen then make treat bags and take them to friends and family together. This year, I’m bringing this tradition back. I recently made a new little treat for us to add to goody bags this year. 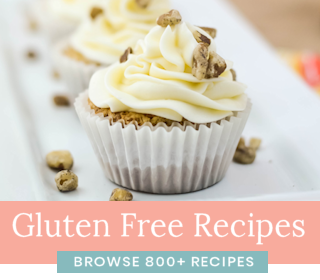 These are so simple the kids can join in! I used Ritz Crackers, then I wedged an Oreo in the middle of two crackers. 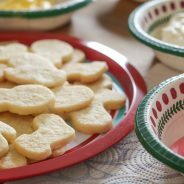 I mixed up a little bit of semi-sweet chocolate with peppermint crunch baking chips, then I drizzled it over the crackers and cookies. 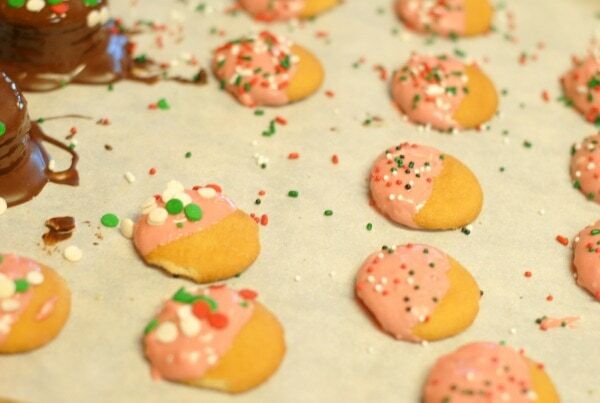 I sprinkled a little bit of Christmas sprinkles and let it harden up. These are amazing, they honestly taste a lot like a fancy thin mint. 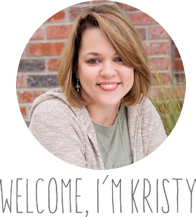 My family loved them and I absolutely loved that my son could join in and assist me with them. 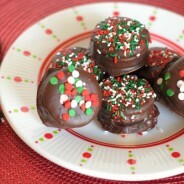 Another big hit with the kids was the chocolate covered Vanilla Wafers. 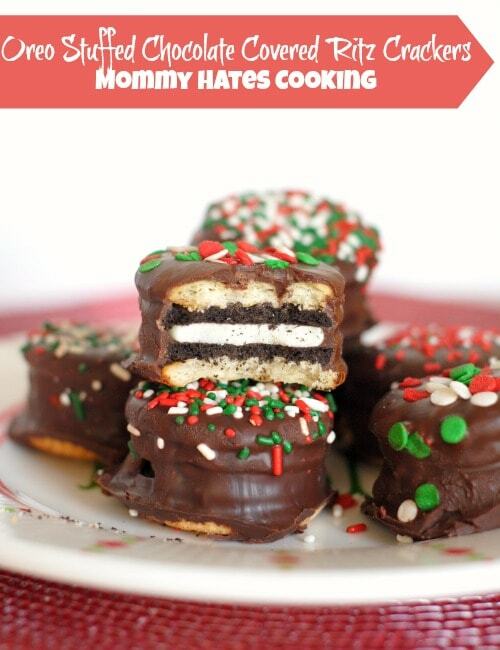 I had my son help me with these, we used white chocolate and also the peppermint crunch baking chips. 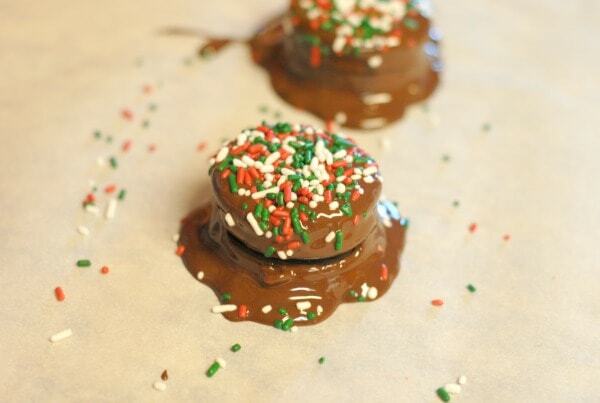 I melted them down and then dipped the wafers in the chocolate and topped them with sprinkles. 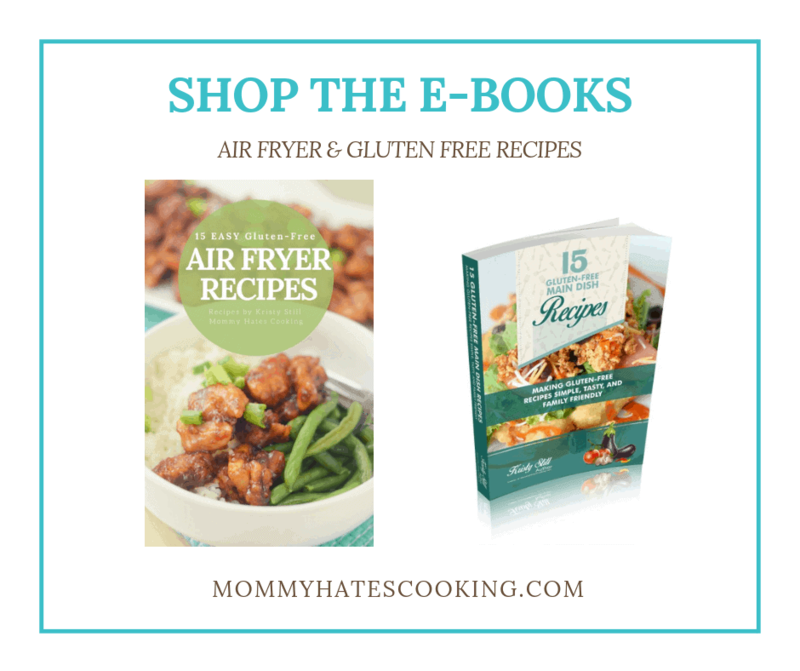 My kids LOVED these and they made a cute addition to our goody bags. I plan to add both of these treats inside our bags this year, then drop them on doorsteps all over town to spread a little Christmas cheer! 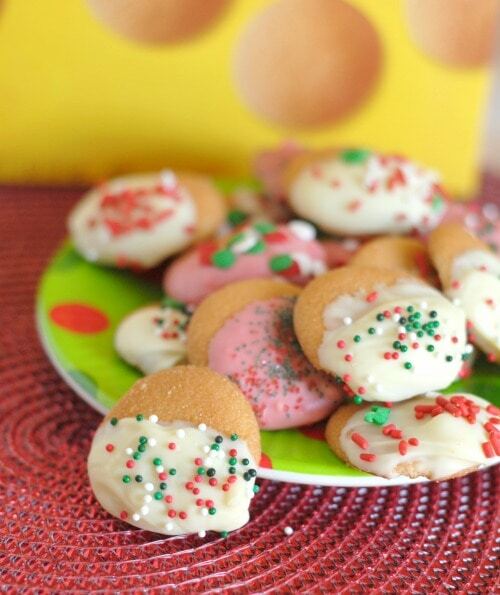 Do you have a favorite recipe for the holidays? 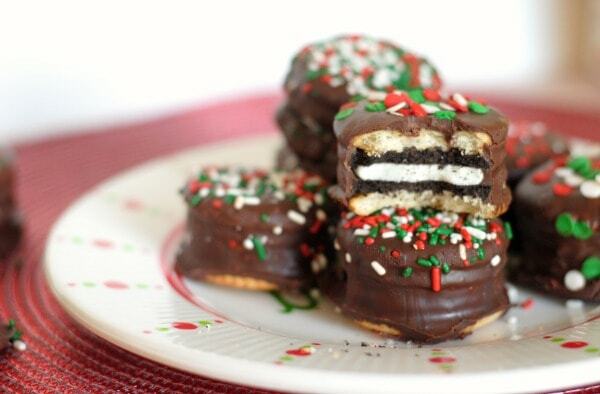 Build the cookie sandwich, placing an Oreo in between two of the Ritz Crackers. 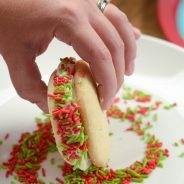 Place each cookie sandwich on a sheet of wax paper or parchment paper. Melt down 4 of the pieces of Baker's Chocolate with 1/2 Cup Peppermint Crunch Baking Chips, mixing well together. I typically will put this in the microwave in 30 second intervals until well combined. Drizzle the melted chocolate evenly over each cookie, being sure that it completely covers the edges and top of the cookie sandwich. 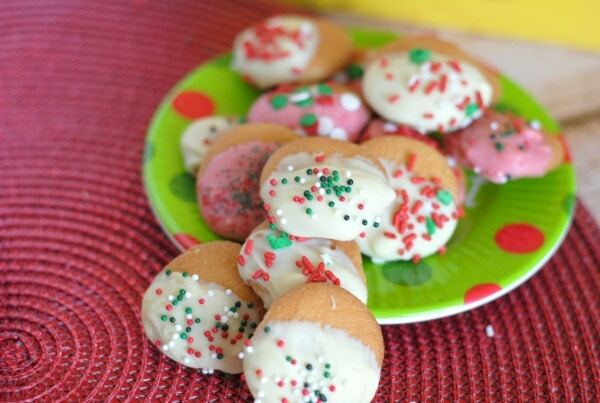 Sprinkle the Christmas sprinkles on the tops of the cookies. Let harden for 3-4 hours before carefully removing. 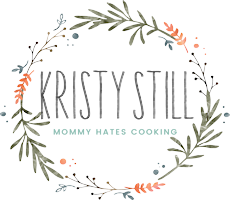 Keep cold in the fridge until ready to serve.